NTEDi Annual Book Scholarship Awards Celebration! Power of Community Job Fair was a Huge Success! 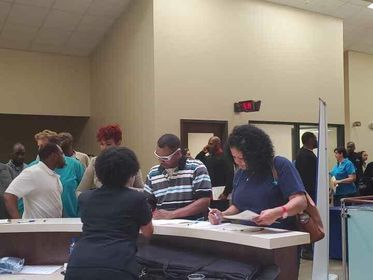 Over 200 people came out to apply for jobs. Participants where able to complete their applications on-site, get questions answered, receive assistance from NTEDi, Spirit AeroSystems and Tulsa Technology representatives. Many of the career seekers where able to be interviewed on-site. Special thanks to Tulsa Technology Center-North Campus for hosting the NTEDi / Spirit AeroSystems "Power of Community Job Fair!" NTDi Guest Speaker Brian A. Black, D.M., Human Resources and Environmental, Health & Safety Senior Site Leader at Spirit AeroSystems shared information related to great career opportunities that exists at Spirit AeroSystems. 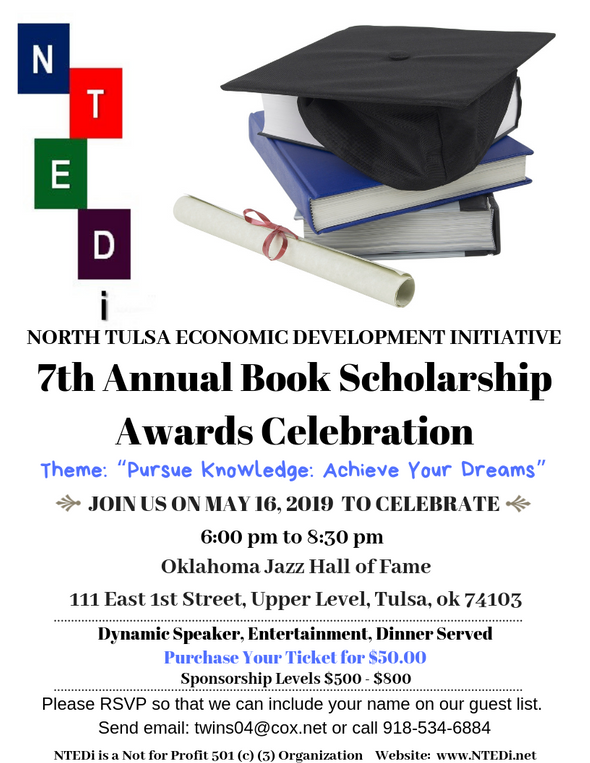 The North Tulsa Economic Development Initiative (NTEDi) a nonprofit 501 (C) (3) is organized to provide leadership for the north Tulsa community based on economic development endeavors, and to improve the wellbeing and quality of life for individuals in the community. NTEDi provides a continuous source of vision, inspiration, innovation and constructive influence in Tulsa, Oklahoma. Key projects and the work of NTEDi are focused on Creating, Investing, and Advocating to Build Wealth in the north Tulsa community, as we support businesses in the community. NTEDi is also focused on promoting quality housing and homeownership in north Tulsa. NTEDi continues to work with the Tulsa community, partners and stakeholders to develop, lead and promote the many great assets in north Tulsa, such as: Good Highway access, 36th Street North Corridor Area, Higher Education beyond high school, Close proximity to downtown, Gilcrease Museum, Land available for development, Neighborhood Schools, Shoppes on Peoria, and the Peoria Connection (Corridor). NTEDi is committed to operating with the highest standard of integrity and serve a as a model for the responsible management and use of human and financial resources. Tulsa, OK – The North Tulsa Economic Development Initiative (NTEDi) non-profit organization 10th annual NTEDi 10th Annual "Education Gathering" held on November 13, 2018 was a huge success. NTEDi serves as a pathway to revitalization and business development efforts for current and future residents of Tulsa. The mission of NTEDi is focused on “Rebuilding North Tulsa One Project at a Time.” This year’s educational event was about preparing students for greatness! NTEDi objectives are focused on helping students be prepared to excel in life and any chosen field. The keynote speaker was Senator Anastasia Pittman, who shared three important things that matter 1) Experience, 2) Leadership and 3) Mentorship. NTEDi Members enjoyed an afternoon handing out candy during the Trunk or Treat annual Blocktoberfest (10/27/18) sponsored by Black Flower Society. THE NORTH TULSA PARENT/COMMUNITY ENRICHMENT EXTRAVAGANZA BACK 2 SCHOOL EVENT WAS AWESOME. THANK YOU TO ALL THE VOLUNTEERS, AND THIS YEARS PARTICIPANTS! Development and Marketing efforts in North Tulsa. Vacant positions at Tulsa Public Schools. NTEDi 2018 Book Scholarship Awards Celebration Keynote Speaker was Caroline Bennett. Thank You for Contributions and Support! Did You Know NTEDi Membership Matter? NTEDi Regular Scheduled Meetings are open to the public. Only members are recognized by the President to speak at meetings and make announcements. However, a request may be granted by president, if non-member made the request 5 days prior to NTEDi Regular Scheduled Meeting. The bylaws nor Robert Rules of Orders extends voting or speaking at meetings privileges to non-members. However, meetings will remain open to public and new attendees may be asked to introduce themselves. For more information, refer to RONR 10th ed. pp. 255, 625. Nonmembers have no rights to the actions taken at meetings (communication shared at NTEDi Meeting June 8, 2015).